Overview. The World Wide Web is filled with constantly changing pictures and images. For example, you can find weather maps, weather radars, road cams, mountain cams, city cams and even scientific images showing things like the solar corona. WIT allows you to capture, save, display, animate and manipulate these images. Below you find a detailed description of WIT and all it features. The image above shows the Main Window for WIT. 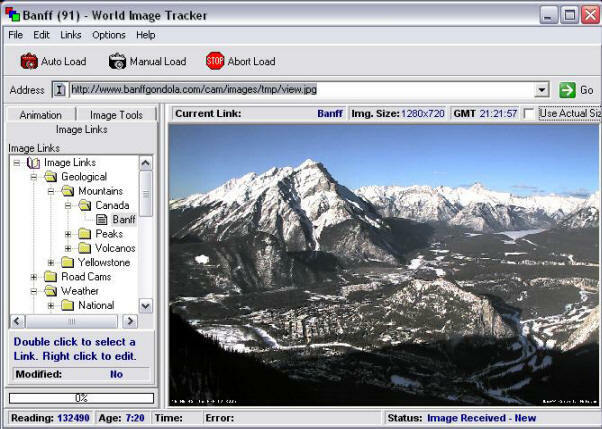 The picture is from a web cam overlooking the city of Banff in Canada. On the left, are the Tool Pages that allow you to acquire and manipulate images. You can also see various Tool Bars and Status Bars. If you wanted to track images with your browser, you would have to remember to hit the "refresh" button every few minutes WIT automatically downloads a new image at regular intervals constantly keeping the image up to date. Time intervals are adjustable from one second to 30 days. Because the web-images are often small, it can be hard to make details. WIT allows you to expand the images so they are easier to see and read. This makes it easy to see the details that would be invisible when viewed on a web page. For example, some weather-radar maps can be magnified so you can track individuals storms down to the street level. WIT automatically saves every image so you can track changes over time and even animate to produce movies of the changes. 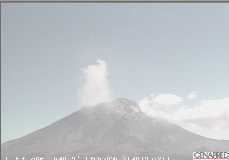 This allows you to do things like track thunderstorms, view road conditions in real time and even watch the eruptions of volcanoes. Playback. 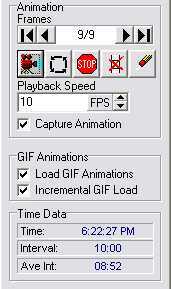 Animations can be played back at any speed and can be continuously looped. Time Stamps. Each frame in the animation is time-stamped, so you can precisely measure when event occur and how long they last. Files. Animations can be saved as frame files, GIF animations or AVI Movie files. Color Tools. Web images are often of poor quality with little contrast and washed-out colors. The image manipulating tools in WIT allow you to improve the color and clarity of the images. 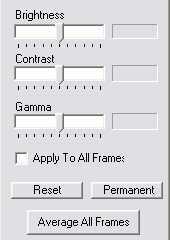 You can adjust the Brightness, Contrast and Gamma of individual frames or the whole animation. 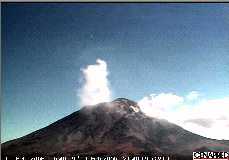 The images on the far right show before and after images of a the Popocatépetl Volcano in Mexico. Averaging. Many images from the internet have a lot of noise in them. This is especially true of night-images. This is because as the light level goes down, the gain on a typical camera goes up. 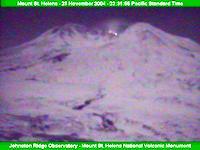 The image to the right show an night image of Mount Saint Helens. You can see a bright spot from red-hot lava, but there is so much noise that the rest of scene is impossible to see. 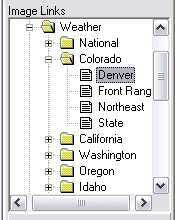 Organizing Your Links. There are thousands of interesting images on the Internet. To help you keep track of images, WIT allows you to save and organize your favorite links in the same way as Internet Explorer. Link can be saved as files so you can share your favorite links with friends. Hundreds Of Links. WIT comes with hundreds of interesting and useful links. For example, there are hundreds of weather-radar links for every state in the US. 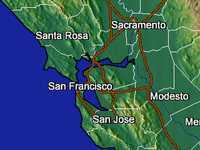 There are also links to active volcanoes, geysers in Yellowstone Park and mountain peaks around the world. 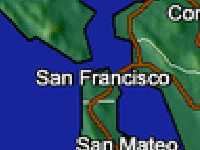 Some web sites have links that change over time. 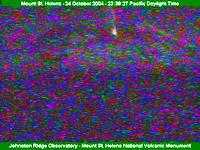 For example, some images will have the hour or date as a part of the filename. For this reason, WIT allows you to put special macro codes into any link. 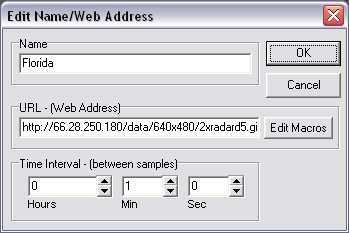 The macros change the filename or path for the link over time. This allows you to track changing images. To make it easy to enter and setup macros, WIT has a special Macro Editor. 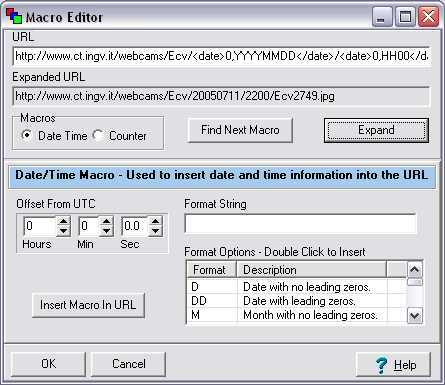 The Editor takes the guess work out of creating and testing macros. The image to the right shows the Macro Editor.